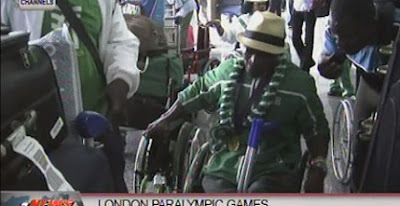 After winning a total of thirteen medals comprising six gold, five silver and two bronze medals in the just concluded London 2012 Paralympics games, Team Nigeria arrived the country on Tuesday to a very low profile reception. According to reports, there was no official of the of the Nigeria Olympic Committee and the National Sport Commission on ground to welcome the Paralympians when they touch down at the Muritala Mohammed International airport except for a representative of the NSC Tayo Oreweme, who took the athletes and officials to the national stadium in Lagos for a reception. The athletes, amid their celebration, called on the government to attend to their welfare and training facilities just as they hope to perform better at future events while others said the government should accord them similar respect, reward as their able counterparts. The athletes are expected to be hosted by president Goodluck Jonathan in Abuja on Saturday.